It is one thing to have impressive record sales, which Billy Joel does — over 150 million units moved worldwide. It is quite another to have sold out shows in large stadiums and arenas — which Joel does frequently. It is yet another feat to sell out 55 shows over four years in one arena. And yet, here we are. 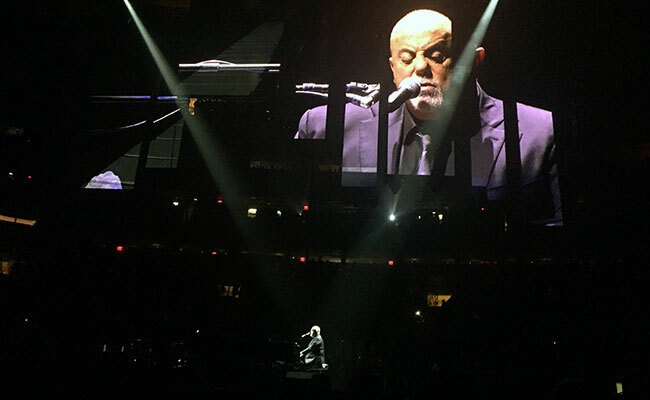 Sunday night (Sept 30th), the iconic Piano Man played his 102nd show at New York’s Madison Square Garden (MSG). He surpassed the previous record for most shows at the Garden by a single artist shortly after starting his residency in 2014. That record was held, ironically enough, by the most recent show I covered, Elton John. Now well into dozens of concerts more than his British contemporary has performed at the fabled arena, Billy Joel’s record will be stand for years to come. And, like a true New Yorker, he is not resting on his laurels when it comes to his legacy as a live performer. Using a setlist of standards, (“Big Shot,” “River of Dreams,” “My Life,” “Movin’ Out,” etc.) Joel finds room to wiggle in some surprises for his fans. During a dealer’s choice segment, fans chose The Stranger deep-cut “Vienna” instead of album single, “Just the Way You Are.” Fans vigorously cast away the latter with their reaction to the former. Of course, Joel knows this. He’s had decades of experience with real-world fans who demand certain songs at which record label execs initially turned their collective noses up. When he alluded to this, one fan reacted with a comical “Boo!” and Joel sympathized. Of course, Joel stole the show right back with a string of hits, closing out his main set with the much-anticipated “Piano Man.” Every time I hear that song, Madison Square Garden shrinks to the size of Tootsie’s Orchid Lounge in Nashville. You can barely hear the man himself over the chorus of 20,000 people. Of course, every time he puts that harmonica around his neck, I hold my breath for “Ballad of Billy the Kid.” It is the one song I dream of hearing live. Alas, maybe one day? This residency shows no sign of stopping! Perhaps the biggest surprise of the night was that Billy Joel even played the piano at all. Early in the night, Joel explained that he burned himself pouring coffee. He showed us the gruesome bruise on his “Piano Cam” — a name I have just now given to the GoPros strategically placed to showcase his digital dexterity. He bitched about it to all of us just as if we were buddies he were trying to gross out at a casual dinner. Of course, it’s hard to imagine someone like Billy Joel performing an everyday task like making and pouring his own cup of Joe. But I guess even rock stars have to deal with the banality of everyday life. “I turned 69 this year,” he said with a grimace. “Funny, I used to like that number, 69.” The Long Island charm and sense of humor played well at the Garden. This is a double-dip for me, and a rarity for the site: Two shows by the same artist. As big a fan as I am, I wish I could answer why I keep finding myself standing in my seat and that same damn arena, singing along to the same damn songs. (‘Damn,’ of course, used lovingly) Perhaps there is no answer. Billy Joel is as culturally ingrained as pizza, baseball, and everything else we partake in without abandon. And just like a slice of New York pizza, I can’t wait to have more.